Kegels are a series of exercises that can help tighten up the Pubococcygeus Muscles (PC Muscles). Kegels are strength-building exercises that contract, flex and release the pubococcygeus (PC) muscles of the pelvic floor. Dr. Arnold Kegel first brought to lime light the importance of Kegel Exercises in 1948, but the importance of his work was realized well after his discovery. PC Muscles originate from your pubic bone and ends at your tailbone. Both men and women have them. Pelvic bone has a hollow center, your pelvic floor muscles work like a netting system in the hollow pelvic bone center and hold up all your inner organs and intestines. Urinary and bowel incontinence is a big problem, especially for those who are mature in age or with poor muscle tone. Many men struggle with leakage after a cough, a sneeze or a laugh, and with overnight accidents or difficulty holding in their bowel movements. Kegel Exercises have been linked to improved bladder control. Kegel Exercises are also used in the treatment of male prostate difficulties such as prostatitis and BPH (benign prostatic hyperplasia). Many factors can weaken your pelvic floor muscles, including pregnancy, childbirth, surgery, aging and being overweight. · Women who have experienced pregnancy or cesarean sections have found strengthening their PC muscles to be extremely helpful to improve vaginal and pelvic muscle tone. · Kegel Exercises can produce strong pelvic muscles that can help prevent pelvic prolaspe, which occurs when organs such as the uterus move or shift out of place. 1. Locate Kegels Musscles or Pelvic Floor Muscles. One of the easiest ways to locate your muscles is during urination. · Halfway through urination, try to stop or slow down the flow of urine. · Do not tense the muscles in your buttocks, legs, or abdomen, and do not hold your breath. · When you can slow or stop the flow of urine, you’ve successfully located these muscles. · Contract these muscles for a slow count of five. · Release the muscles to a slow count of five. · Do a set of 10 Kegels daily, three times a day. How to do Kegel Exercises by Women. How to Locate Kegels Muscles or Pelvic Floor Muscles. Locate Kegel Muscles as discussed in previous section. Start with an empty bladder. Imagine that you are trying to stop yourself from passing gas and trying to stop the flow of urine midstream at the same time. The feeling is one of “squeeze and lift”( a closing and drawing up of the front and back passages). If you’re not sure you’ve got it, one way to check is by inserting a clean finger before doing a Kegel. If you feel pressure around your finger, you are on the right track. Squeeze and lift without pulling in your tummy, squeezing your legs together, tightening your buttocks, or holding your breath. Ensure only your pelvic floor muscles should be working. 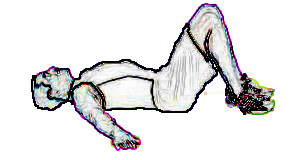 · Contract Pelvic Floor Muscles for 5-10 seconds, relax, and repeat 10-20 times. · Breathe normally during the exercises, and do this at least three times a day. · Try not to move your leg, buttock, or abdominal muscles during the exercises. After 4 – 6 weeks, most people will notice some improvement; however, it may take as long as 3 months to see a major change.